Work integrated learning (WIL) connects students with industry, business, government and community with the intention of creating authentic learning experiences that strengthen students’ capacity to develop work-ready skills. WIL has emerged as a key strategy for educational institutions in response to changes in tertiary education and the demand for graduates with work related capabilities. 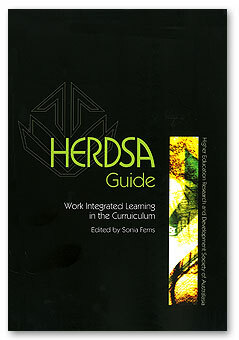 This HERDSA Guide highlights the uniqueness of WIL and the opportunities and challenges it affords. The Guide provides insights into curriculum design, performance-based assessment, academic standards, risk management, institutional leadership, building staff capacity and evaluation strategies for WIL. The Guide offers a range of existing, new and emergent perspectives about WIL in a global context and provides useful information for practitioners and institutional leaders.